This is the next little set of experiments using different resists. I've heard of people using Sharpie permanent marker as a resist, so had to try that out as I'm always looking for ways to mask out areas precisely. 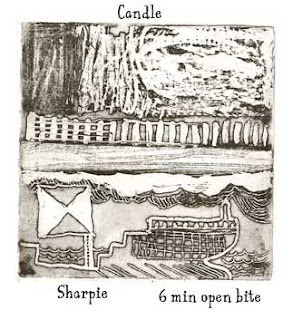 Its fantastically fine detail, and works on an open bite etch. 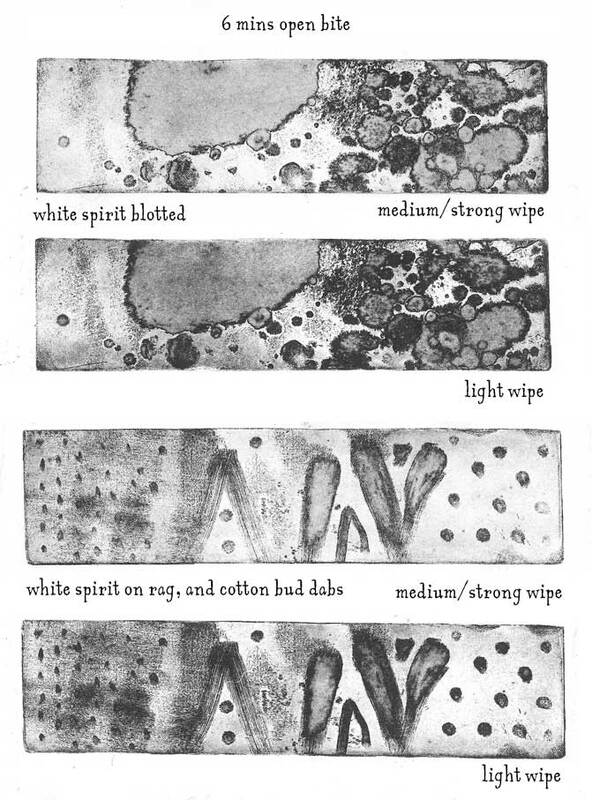 It doesn't work with icing sugar aquatint though, it cleans the BIG (Baldwins Intaglio Ground) off the plate. 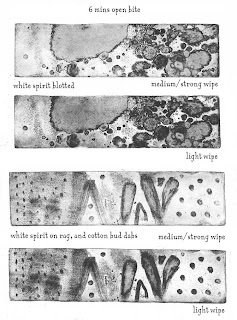 More open bite experiments- the drops of white spirit work really well as marks, and the wipes on the lower two prints are just a cotton rag with a little white spirit wrapped round my finger. The 2 plates are printed twice- the first versions have more ink wiped off than the second ones; just to see how they would look if treated differently. The final print is great if you want a blackboard and chalk look. The Sharpie on the right didn't work- it just cleaned the resist from the plate, not helpful really. The Caran D'Ache water-resistant crayon was good, in steps (left side of print). Candle works well as just a rough texture. A good challenge would be to try and make a print by using only crayon and candle. The next print will hopefully use some of these marks.